You are warmly invited to attend this event – please register at https://www.eventbrite.com/d/united-kingdom–glasgow/lisen/. Please forward this communication to any colleagues whom you think might be interested in attending the event or joining the network (I have attached a leaflet and a membership form). 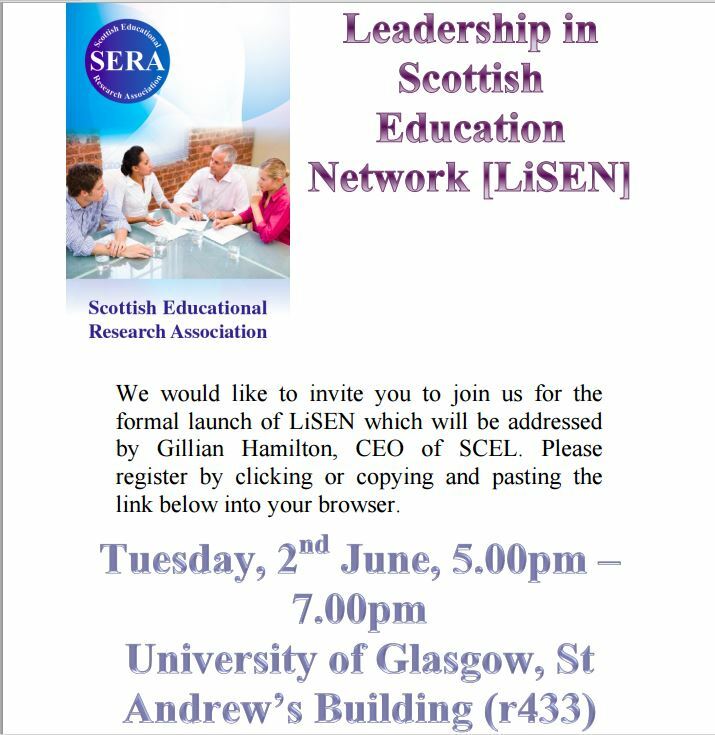 Membership of the network is open to non-SERA members although we would clearly encourage colleagues to join SERA. In our customary tradition of collaboration we have been invited by the chair of the National PL Network, Gillian Hunt to share the latest update on their work. Thanks Gillian, I’m sure this will be of great interest to SELMAS members. Welcome to the March Digest! Lots has been happening in the Scottish Professional Learning Network with our first Network Day of the year taking place on 23.2.15 at the University of Edinburgh, our Professional Learning Network Committee meeting on 3.3.15, the announcements made by Nicola Sturgeon about the new qualification for headship and additional funding for masters and planning for our next Network Day on Tuesday 26.5.15. 	Teaching Scotland’s future Legacy Event 6 May 2015 in Edinburgh. 	Raising attainment – Improving attainment/closing the gap. There will be £100m over four years with a first tranche of £20m for 2015/16 announced. Focus will be on literacy/numeracy/health and wellbeing in the primary sector. 	Nicola Sturgeon announced on 23.2.15 that the new qualification for Headship will be mandatory 2018/19 (legislation to come) for new head teachers. SQH or FRH already awarded are valid. Those with that qualification and new to headship may wish to engage in the ‘Extended Induction’ (see below). 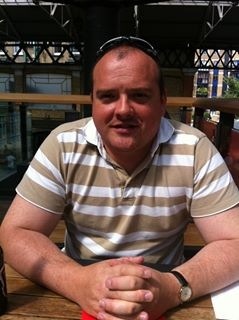 	Other posts will follow and an advert for consultants is out now. Consultants are required to deal with capacity and can be from within and out with education profession. Expressions of interest are also sought from recently retired colleagues. Consultants will not be advising SCEL on what to do but to take forward pieces of work over a fixed period. Paying £250-400 a day. 1. What are the ways we support the roll out of information and ideas across our organisations? 2. What are the barriers to the flow of information? 3. What are the successful ways information gets shared and discussed? 4. Where do we need to build our capacity and what would help? 5. What next steps should the PLNetwork take? The collation of responses will be posted soon. At the Committee Meeting on 3.3.15 we discussed the Network Day on 23.2.15 and began thinking about the next Network Day which is on Tuesday 26.5.15 at the University of Strathclyde. Some of the ideas we came up with are: approaches to professional learning/work-based learning; reflecting on the impact of professional learning; learning for sustainability; Developing the Young Workforce – possible cafe conversations exploring what professional learning looks like, how primary schools contribute to DYW, how early career teachers are encouraged to think about DYW; and an update from Scottish Government. It was agreed that whatever we feature will be a follow up to the TSF Legacy event on 6 May 2015. The planning group taking this forward are: Roseanne Fitzpatrick; Celia McArthur; John Daffurn; Susanne Batchelor; and Rebecca Chad. It was great to welcome 56 members of our Professional Learning Network to the University for our first Network Day of 2015! At that event we had an update from David Roy from Scottish Government, a session on Developing the Young Workforce (the Wood Commission) with Joan MacKay of Education Scotland, a comprehensive update on the Scottish College for Educational Leadership (SCEL) from its Chief Executive, Gillian Hamilton and her colleague Lesley Whelan and an activity session on the reach of the Network. 1. What was most useful to you and why? 2. What would you like more of? 3. What are you willing to share at a future Network Day? We were delighted to welcome 56 delegates and most of you used the room to network with colleagues prior to our 11.00 a.m. start. However we did lose many delegates throughout the short day and by the time we were on our last session (2.00 – 3.00 p.m.) on the reach of the Network we were down to 29 delegates. So with that in mind our last question is around start/finish times with a view to holding onto delegates for each of our sessions. 4. Would you prefer an earlier start/finish time to enable you to stay for the whole event and are there any suggestions you have in terms of timing/length/organisation of the day? Present: M Alcorn (in the chair), S Beattie, R Cook, G Hamilton, G Hunt, J McKerrecher, D Murphy, C Oates, J Robertson, G Walsh, A Wood. Minutes and matters arising: the minutes of the previous meeting were agreed as an accurate record. SELMAS Forum: the usual format, including flowers, will operate. Margery McMahon will facilitate the evening. Speakers: Brian Boyd, Juliette Murray (Surgeon), Jim McColl (Clyde Blowers/ Newlands College). Discussion centred in part on costs and it was agreed to repeat the discount for new SELMAS attenders, £30 per ticket, with discount tickets for new attenders of £50 per pair. AW to discuss with St George’s the possibility of a wine at the end of the session. The publicity should mention, in the context of drivers, the availability of drink. AW will send out publicity over the coming weeks. SELMAS Banner: the banners have been purchased and are on show. Thanks were expressed to colleagues who helped purchase and transport these. Conference Focus Group: a meeting of the focus group (agreed at our last committee meeting) will take place on Wednesday 4 February in Waverley Court to consider how best to plan for next year’s conference. Guest, Gary Walsh, Character Scotland: Gary thanked SELMAS for the invitation and welcomed the opportunity to work collaboratively. Character Scotland is a charity operating since 2009. Its schools based programme, a legacy of the 2014 Commonwealth Games, is Inspire, Aspire. It has reached some 55 countries across the Commonwealth and seeks to encourage an international dialogue among school students and young people generally around values and attitudes. The second strand looks at character education more generally and seeks to create a space for discussion and debate around such issues. The charity is project funded until August 2015. The project is culminating in a 2-day conference on the 15-16 June in the University of Glasgow with Avis Glaze as one of the key-note speakers. Unfortunately, Judith McClure, one of the speakers for tonight’s event has had to withdraw. SCEL, possible joint event: Gillian Hamilton noted that she had now been in post at SCEL for five months and a full board is now in place. Senior staff have been recruited form a range of sectors and the service of consultants is also being pursued. SCEL is now at the stage where it must move from strategy development to practical work. SCEL will now focus on three or four priorities, including its headteacher programme, and seek to build its potential over the next period. In building SCEL’s profile, the organisation is keen to develop cooperative working relationships with a range of relevant organisations, including the strong possibility of a joint SCEL-SELMAS event. The possibility of a joint event focussing on a question such as ‘What is, and how can we best develop, leadership among teachers?’ was discussed. There was discussion about filming/recording such an event (and other such events) for the website. It was agreed that such a joint event would be desirable and there was discussion about administrative approaches to facilitating such an event. Jude McKerrecher intimated a joint Scottish-Chinese Headteacher event on 29 April organised by KISS. Centre for Confidence and Well-being, possible joint event (MA): MA mentioned the interest which had been generated by Danny Murphy’s new book. DM spoke about the conclusions of his book around the inequitable nature of the recognition and accreditation of achievement by young people in schools and the possibility of some unified form of ‘Scottish Graduation Certificate’, one not simply about academic attainment but about a wider profiling purpose. GH raised the question of whether such an event should be incorporated into the 2015 conference or as an event to precede the conference. The possibility of such an event in September 2015 was discussed further and it was agreed that MA would meet again with DM and CC to discuss this further. Reviewing and updating SELMAS Aims paper (GH): GH offered a range of ideas to update and sharpen the SELMAS Aims paper. It was agreed this would be discussed further at the next meeting. Review of Committee functioning (AW): AW warmly endorsed GH’s paper and suggested that the definition of the functioning of the committee could be enhanced in the ‘What Can You Offer SELMAS?’ section of GH’s paper, including attendance at meetings and active work. MA also stressed the need for broader representation on the committee. Agreed to circulate draft and that this also would be discussed further at the next meeting. Trasurer’s Report (GH): G Hunt presented her treasurer’s report (attached). Last Scottish government payment March 2014; agreed to pursue further now and possibly also to approach the Gordon Cook Foundation. Agreed that our general approach should be that events should pay for themselves. AOCB: there was no further competent business. Next Meeting: It was agreed that the next meeting would be at 00 pm on Thursday 26 March 2015, in Waverley Court. The Scottish College for Educational Leadership is currently recruiting for a Programme Leader, with a closing date of Friday 27th February. The successful applicant will work with the growing team at SCEL to lead on a number of activities in relation to leadership development, including the development and maintenance of the Framework for Educational Leadership, and to contribute to the strategic and operational development of SCEL. The appointment will be for a fixed term contract of up to three years, and we are also willing to consider applications on a seconded basis. Bowling Uphill in the Wind! Tuesday 25th November 2014 saw The Scottish College for Leadership in partnership with the Virtual Staff College Scotland present Andy Hargreaves leading a workshop on Uplifting Leadership at Murrayfield Stadium. The event included Alan Boyle who co-authored the book (along with AlmaHarris) and each delegate received not only a copy of the book but also a workbook of activities.Born and raised in Accrington, Andy started his teaching and lecturing career in England, eventuallybecoming professor of education at Boston College. Ranked among the top 12 most influential educators in the United States, Andy has written over 25 books on leadership and change which have been translated into many different languages. The interactive workshop, based on research of 18 organisations and systems in business, sports and public education, allowed participants the opportunity to work individually and in small groups to connect the key ideas to their own practice.An auspicious occasion, the first event of its kind, we were told immediately that our views would be challenged, that we would be challenged to change and improve, because schools are not doing well enough; well enough in closing the gap, supporting the most vulnerable or reducing youth unemployment. 1. Taking opportunities others have missed. 3. Turning weaknesses into triumphs. 4. Changing something that is succeeding. 5. Disciplined innovation – getting left and right brainers together. ‘Only psychopaths are unafraid!’ Moving towards resistance despite the fear we all feel at a certain level was highlighted as an exciting path to follow, which underpinned the drive of many successful leaders. At this point we were asked to consider our choices and then share with partners and then our group. Through sharing and the examples given we were challenged to think about our own styles of leadership as well as what we ultimately wanted to achieve, ‘the dream’ as Andy defined it. But before we reached these we had to consider how we uplifted ourselves and others, as well as the ‘downers’ which faced us all and how we could avoid them. ‘Leading the right things, for the right reasons, in the right ways’, an inspirational call to us all. Asked to consider what gave us our ‘lift’ and what our ‘dream’ was; staff teams were able to engage in some really effective sharing of ideas and planning at some tables. ‘Bowling uphill in the wind!’ was used to help us consider the lift we felt in our own settings when moving towards resistance. ‘Co-opetition’ a concept some grappled with but exemplified in the investment in cricket in Pakistan and Dogfish Head beer, both examples which highlighted that competition was essential for success. Working for a higher purpose, increasing the profile of all involved and stimulating our own practice, a model which many embrace already, and which we were told could benefit us all. But hopefully we can be better, better at closing the gap, supporting the most vulnerable and reducing youth unemployment. Andy Hargreaves and Alan Boyle wanted to write a leadership book that would sit inauspiciously in an airport shop waiting for a passing businessman to pick it up. The twist would come when he read not only about outstanding business practice, but also about miraculous successes in education. Hargreaves challenged us to reflect upon times in our professional lives when we felt uplifted and what types of things had made us feel that way. ‘Uplifting Leadership’ by Andy Hargreaves, Alan Boyle and Alma Harris is the final product. He also asked us to consider low points and leaders who had left us feeling further from inspiration. The session was interactive, so delegates were asked to think, get up, pair and share. Although this took us immediately out of our comfort zones, the idea was a good one because we were able to meet and share with professionals from across the country. Not one of them implemented a ‘no excuses’ policy. The life needs outside of work were recognised and people were valued for what they could give. “Identity is the path to achievement- If you don’t know who you are as an organisation, you won’t know what to do. There was discussion around monitoring and evaluation. It was suggested that in sport organisations use real time data to improve performance. There was a recognition that comes after the fact can’t help pupils to improve outcomes and results or help them to change direction before the iceberg hits. It would be easy therefore to conclude that real time feedback needs to come before assessment. We were then asked to consider our single most important dream for our home organisation. We were asked how we were going to get better and what the future would feel like when we had achieved what we had set out to do. The notion of ‘coopetition’ was also introduced. Successful organisations share with their competitors. Nobody wants to watch one team destroy another team week after week. Examples were given in baseball, education and football of situations where teams helped their competition to improve for mutual advantage, a higher purpose, to increase profile and common share in an attempt to stimulate discussion and better practice. We finished with a discussion around whether we were measuring the correct things. Should we be measuring wellbeing, innovation, entrepreneurship? Please see below a circular from SCEL, firstly, inviting nominations for the final place on the SCEL board, secondly, advertising vacant posts with SCEL, and, thirdly, inviting responses, from individuals and from organisations, to a consultation on Models of Leadership Development. SELMAS encourages all interested parties to consider these matters and to respond to this invitation to contribute to SCEL’s vital work on Leadership Development. I am writing to provide you with an update on a number of important developments at the Scottish College for Educational Leadership. There remains one outstanding place on the SCEL Board of Directors. As you are aware, SCEL has a key role in developing leadership at all levels in the education system in Scotland, and we are keen to appoint a teacher to the Board with current, excellent experience as a practitioner within a school, with good knowledge of the professional and leadership needs of teachers and / or middle leaders, and with evidence of demonstrable competence in leading an aspect of learning within a school. We plan to fill this place on a co-opted basis, so it would be helpful if you could share this information with teachers in your local authority who you feel would meet this criteria. Further information can be found on the SCEL vacancies page. We are also recruiting two members of staff to join the team at SCEL: A Director of Programmes / Depute CEO and a Development Officer (teacher secondment). Information about both vacancies is available on the SCEL vacancies page. The posts are also advertised today in TESS, the Herald and the Scotsman, with the closing date for applications Friday 31st October at 5pm. Again, if you were able to share this information with colleagues in your local authority who may be interested in applying, that would be really helpful. Finally, today sees the launch of SCEL’s consultation on National Leadership Pathways and a National Headship Programme. The Consultation Report and a respondent pro-forma are available here with the consultation open from today until Monday 3rd November. We welcome responses from both individuals and organisations. Local Authority feedback on the consultation is really important, and if we can provide any further information on the consultation at this stage, please let me know.